"Don't Worry, Be Hoppy" was made for a challenge for my art quilt group, Artique, where the quilts were all black and white with one added color which we drew randomly from a bag. I drew green, which immediately made me think of a frog, but I wanted to design it without making the frogs green. 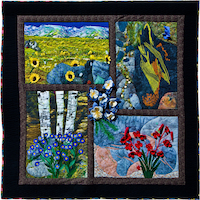 This quilt was in an exhibit at the Denver International Quilt Festival, hung in the Colorado Lieutenant Governor's office and was juried into Art Quilts XIX: Permission to Play at the Chandler Center for the Arts in Chandler, AZ. 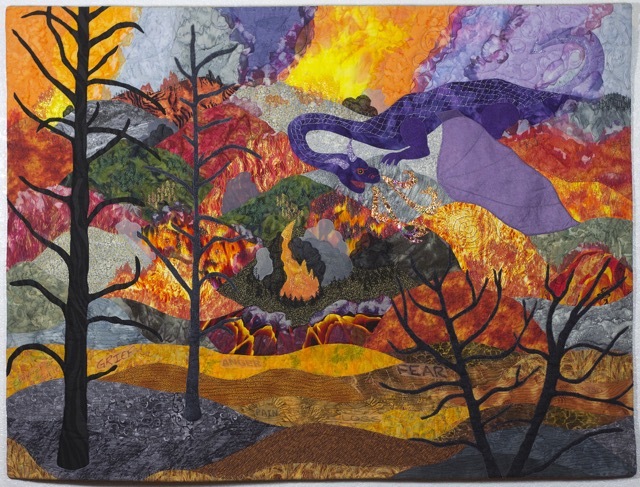 "The Wildfire Breathing Dragon" was made after the High Park Fire burned more than 87,000 acres in 2012, and nearly destroyed my own home. As I talked with other survivors, and tried to understand why my home survived and my neighbor's home burned to the ground when they were constructed of identical materials, I developed the myth of the fire breathing dragon flying through the canyons. The capricious behavior of the dragon explained the inexplicable behavior of wildfire. 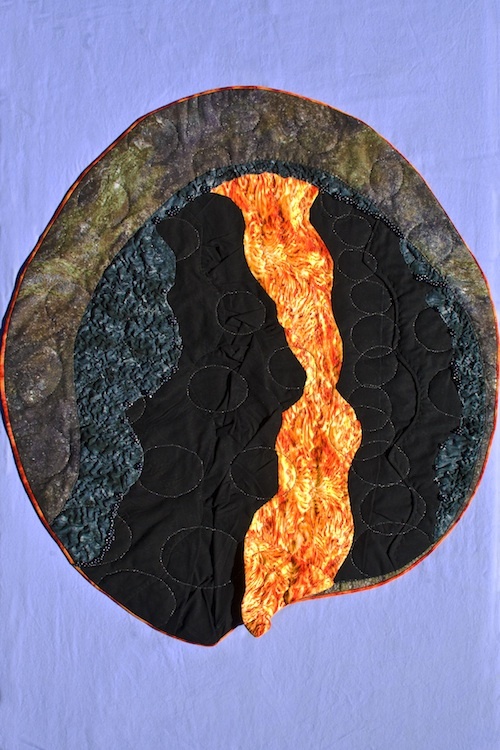 In the foreground, using organza, I printed the emotions with which the survivors of wildfire struggle once the flames are extinguished and cleanup begins. 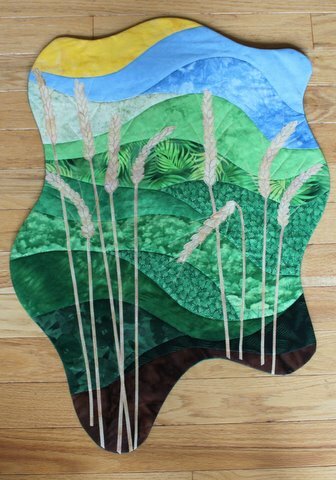 Making this quilt was part of my own healing in dealing with this emotional event, when I no longer felt safe in my own home. 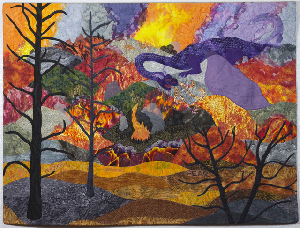 The "Dragon" was hung sideways at the Denver International Quilt Festival, so that viewers could see the back of the quilt as well, which is both a humorous tribute to the "wild" firemen who risk their lives to save our homes, as well as a photo collage of my personal experience of the fire. I'm always trying for something abstract. This time I did it thanks to Vikki. This hanging was made for Guild Challenge using Vikki's Topstitch Piecing Appliqué method. 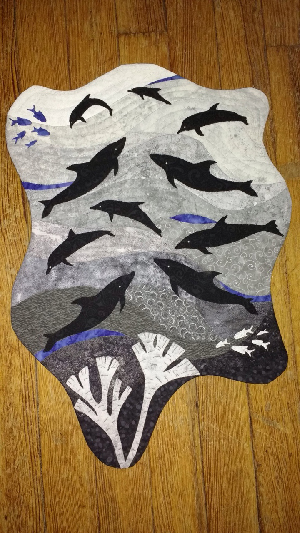 The theme was Shades of Grey so I made an underwater scene with grey fabric and then appliquéd on black dolphins. 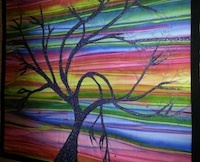 We could choose one other colour and I add the bright blue to give the hanging some zing. I have not yet had the opportunity to take a class with Vikki but learnt the technique from her excellent books. 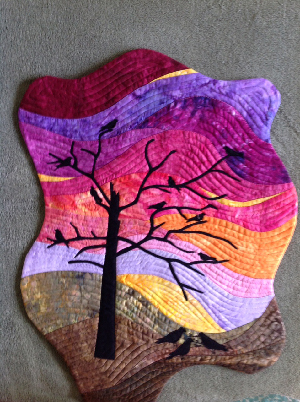 This is another hanging made using Vikki's great Topstitch Piecing Appliqué Method. I have used bright sunset colours for the sky but at the same time hope to give a peaceful feel to the piece with the silhouette of a dead tree with crows roosting for the night who are for once silent and in harmony with the landscape. "Day Three of Creation: Sea, Land and Vegetation." 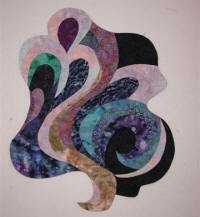 I was one of the students in your Curves class at Sacred Threads. 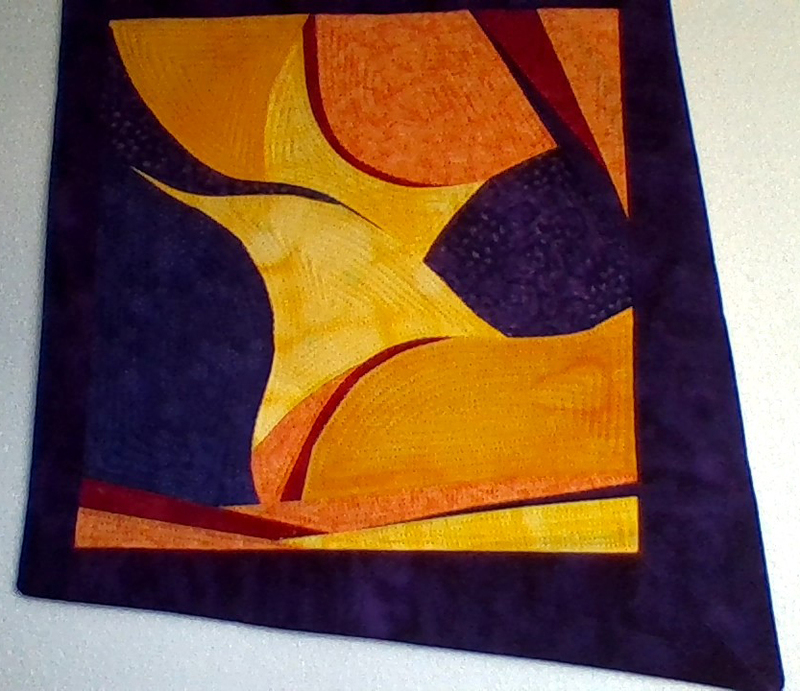 Never did finish the piece we started in class, but I put your techniques to use in a larger quilt. 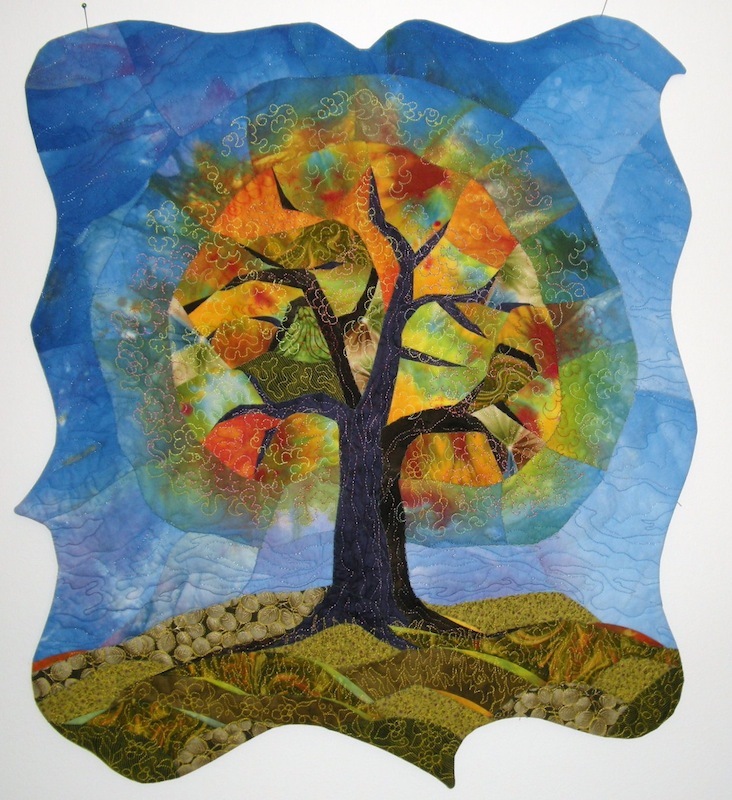 My guild wanted to make a gift for our host church and settled on a suite of 7 quilts representing the seven days of creation as told in the Judeo-Christian tradition in fiber art. I drew Day 3– creation of dry land and the plant kingdom. Except for the pomegranate bush and fruit – which I fused – the quilt is entirely done using your curved piecing technique. It was a lot of fun, and very freeing. I know I'll do more using his approach. Thanks for showing me the way. 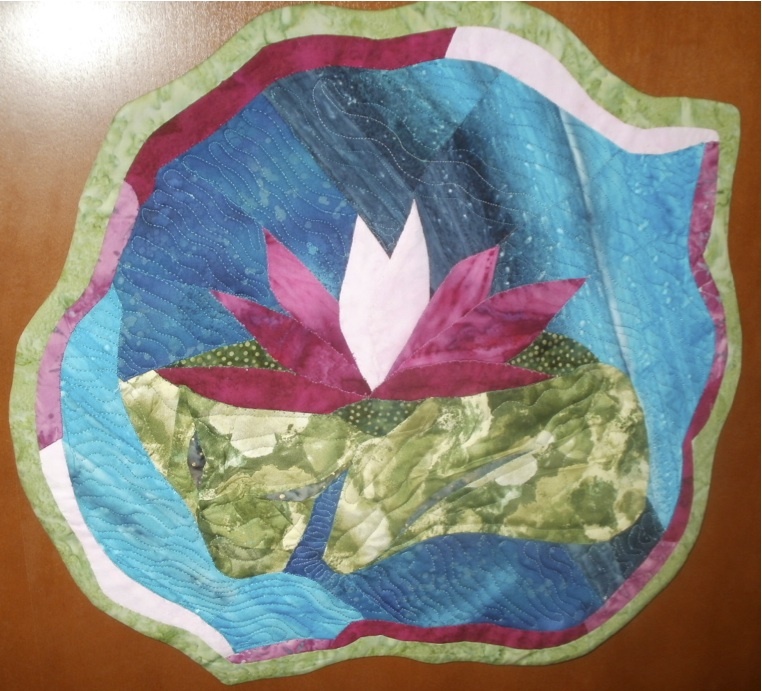 This quilt called "Waterlily" is from a pattern from Vikki Pignatelli's class that she taught the Western North Carolina Quilt Guild in October 2015. I tried to mimic her style while trying to learn the process. It was a fun and informative class and I am sure I will use this technique again in another quilt. I made this piece from photos i had taken of a sunset in Sedona, Arizona. 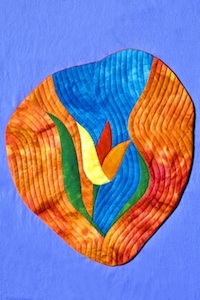 It was created during a class with Vikki at Quilt Surface Design Symposium class some years ago. Her techniques enabled me to express more accurately the mood I was trying to create and encouraged me to continue along the road of non-traditional quilting. 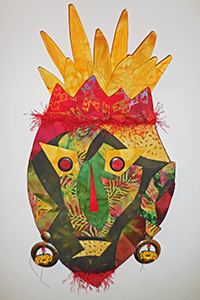 "Razzmatazz: Girls Just Want to Have Fun"
This improvisational block started off as chaos and evolved into a mask, inspired by the shape, the fabric, the teacher, and the other students in the class. 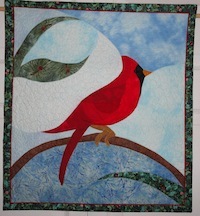 This quilt was done as part of a Round Robin with 6 other friends from the Ohio Valley Quilter's Guild. 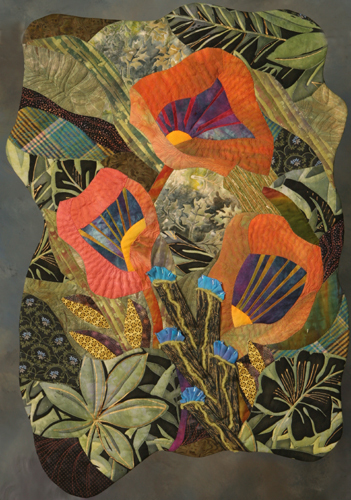 The owner of this quilt is from both Minnesota and Arizona, and the goal of the outer border was to encompass both areas as smoothly as possible, while adding some of the flora and fauna from the regions as well. I used Vikki's method of designing the mountains, mesas, hills, river and lake by drawing them on freezer paper. I cut it apart one piece at a time, ironing it onto the selected fabric, then turning under seam allowances as needed. 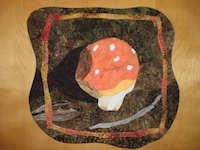 I then placed the fabric patch in the place of the freezer paper shape and moved on to the next piece. I did use Roxanne's Glue Baste It to help hold the pieces together, then stitched them all together to a 'base' of the background fabric - the blue/black starry fabric. 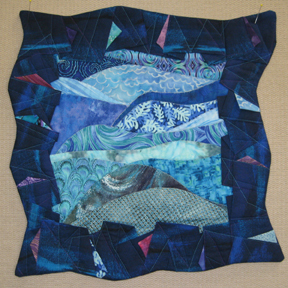 The only parts of this quilt NOT done using Vikki's method are the Bears in Trees through the Waterfall - maybe about 2 feet or so. Vikki herself was very supportive of the project and an invaluable resource. Thanks Vikki! After taking a class from Vikki in May 2001 our guild had their quilt challenge for the year which was to make a quilt that represented the title of a song. 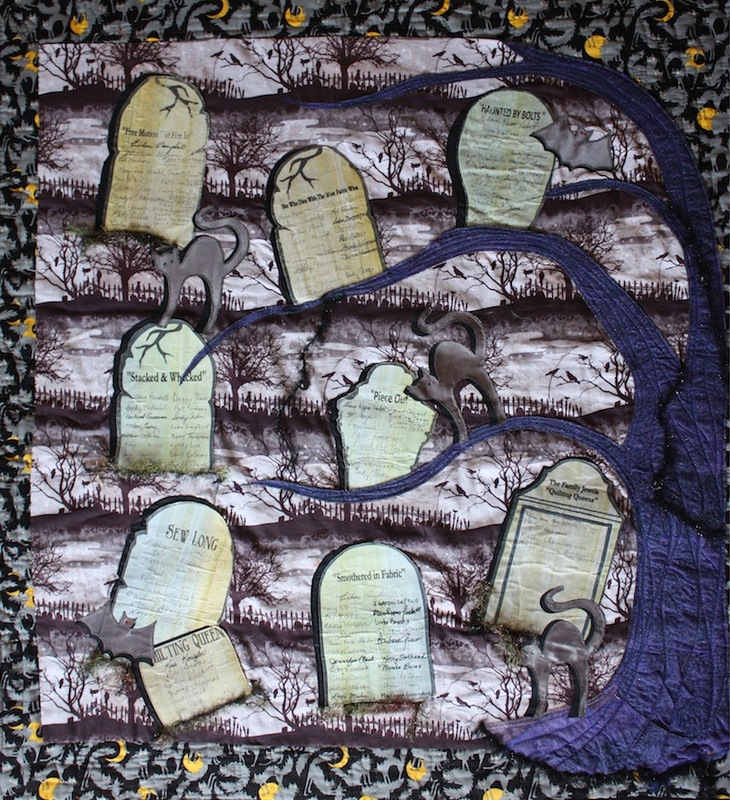 My small group called themselves "The Pointer Sisters" so I decided to make the quilt about one of their songs. "Fire" was my choice and piecing the flames for the fire was perfect for using Vikki's technique. 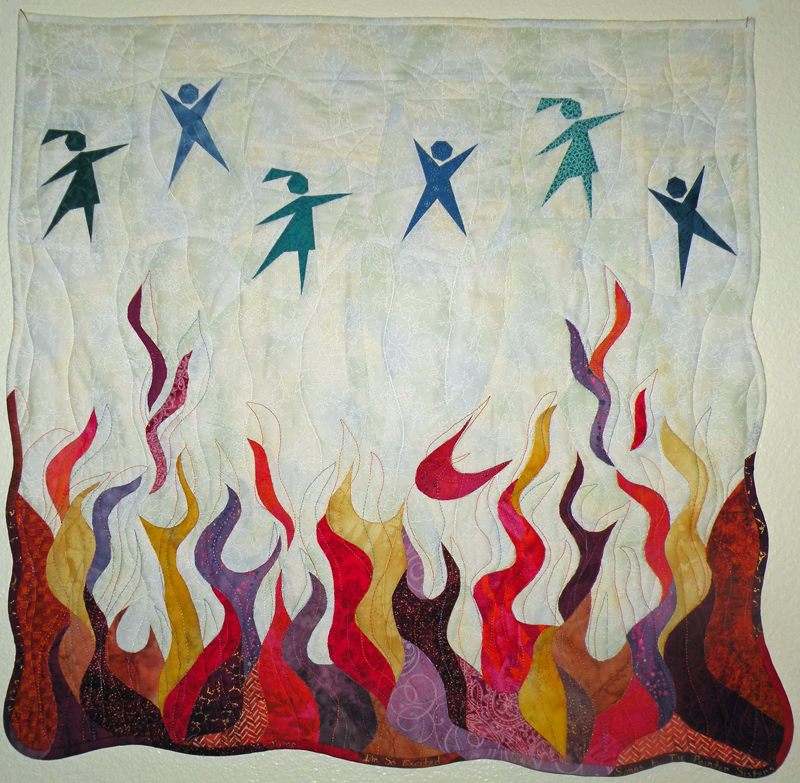 The members of my quilt group are included in the quilt across the top: Jan, Sue, Abbie, Patty, Kathy, Adele and I am represented as the fire. Vikki I had such a great time in your class at Asilomar. 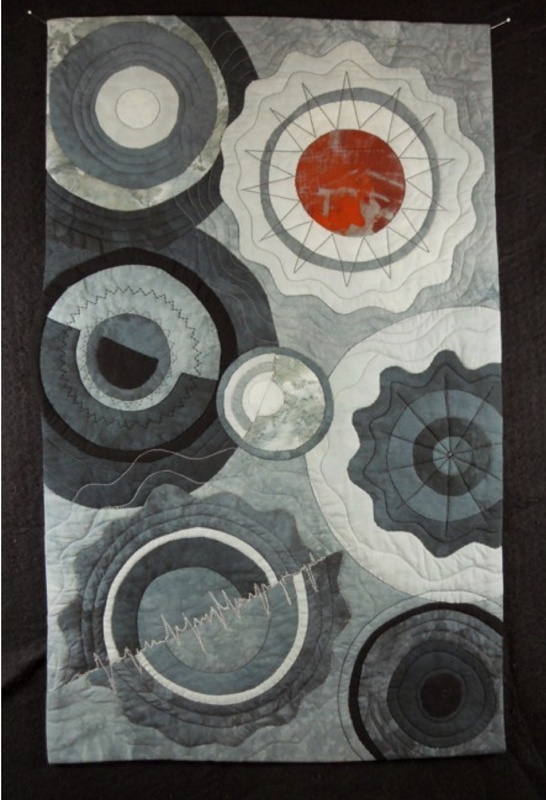 I think I'm in love with your free form quilting. I was supposed to do a snowball block for a friend who had just been diagnosed with breast CA. This is my block. Thank you for opening up a new side of me. I love to do strip piecing and gentle curves hence put them together with your fundamental improvisational technique "blocks". I am very pleased with the outcome. 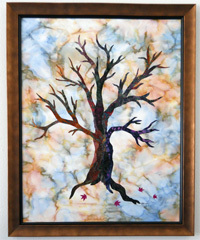 The tree is felted with purple, black and blue tulle. 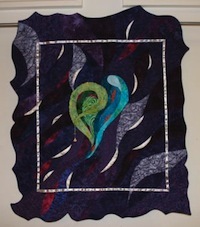 I then used a large piece of sparkly dark blue chiffon felted into the piece. 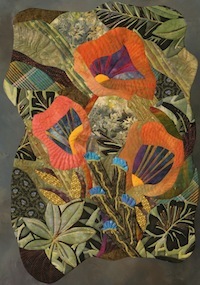 Techniques from Three Salmon Lilies in Blueberrium Patch came from Vikki's workshop. "Vikki, I think of you often as I have used this technique in several projects. I made a large piece then cut and organized the pieces as I needed them. There is some wool roving, metallic threads etc. in this piece." I was fortunate to be invited by my mom to go with her on an Asilomar retreat. We greatly enjoyed meeting you and taking your class. I thank you for breaking me out of the box of sewing straight 1/4" seams and mixing it up with crazy curves and new techniques! I love my table runner! I'm enjoying the piece and using it as table mat. Thanks for sharing your ideas. Dancing in the Kelp Forest was inspired by a trip to the Monterey Aquarium. 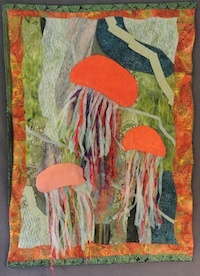 The sea nettles jellies with their translucent oranges waltzed with grace and mesmerized the humans watching. 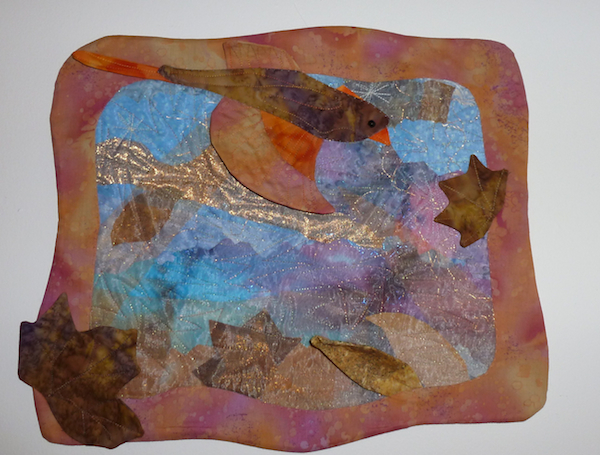 Working with Vikki at Asilomar inspired the use of poly sheer and other textural elements. Her curved technique and wholecloth facing made the vision possible. I was so inspired after taking a two day class with Vikki. 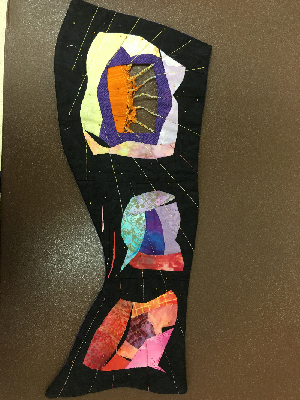 I never did finish what I was working on in the class but started thinking about this quilt and using the curved piecing technique to complete it. The next week my husband and I travelled to Fargo, North Dakato to pick up a motorcycle trailer and I sketched all the way there. When we arrived I noticed the trailer business was a couple doors down from Mill Ends, so I walked over while he was taking care of business. 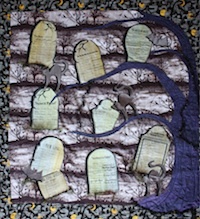 I found the fabric for the background that gave the quilt a kind of rusted old sign look which was the inspiration for the oval shape and chains to hang it. The quilt which combines his love for motorcycles with my love for art and quilting hangs in our living room. 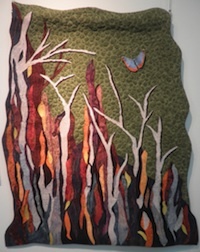 I discovered Vikki Pignatelli at the WV Quilt Guild show at Summersville, WV, June, 2012. 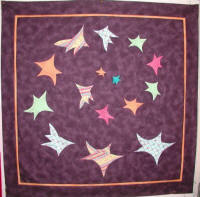 After having to close my shop in 2010, I lost the spark of quilting. 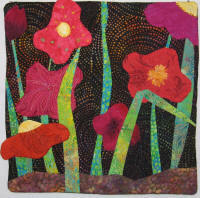 When I saw Vikki's work, I fell in love with quilting again and found a new love for felting. I didn't know anything about felting but wanted to learn. My husband bought me a felting machine for Christmas but I had no idea what to do with it. I emailed Vikki several times and she emailed me back every time. This is my first project I worked on. I feel starting small is best for me. I started with a piece of felt for the foundation and started to add the wool roving. It was fun to see what I had in my mind come to life. The tree is from yarn that had a lot of texture in it. Vikki told me to just go crazy with the quilting and suggested the colors of threads and where to place them. 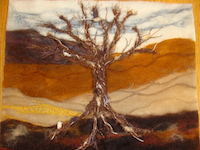 The name for this felted piece is Standing Alone because there are many times in my life I have felt that way. I also know many can related to that feeling. 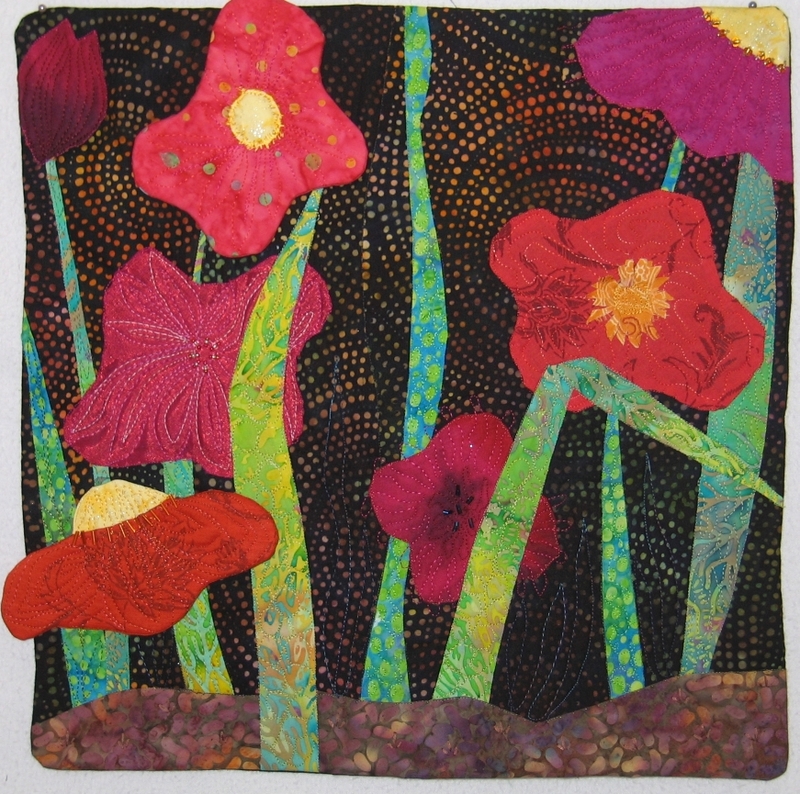 I am just so grateful that I met Vikki and got my love back for quilting and my new love for felting. The series is a result of many learning experiences and a fiber arts challenge. The subject of the challenge was �Communications�. My goal was to represent facets of miscommunication. I was influenced by the 2012 tumultuous political campaign. This design is a visual representation of the many waves of miscommunication or noise that interfere with an accurate signal being heard as described in Nate Silverman�s book of the same title. 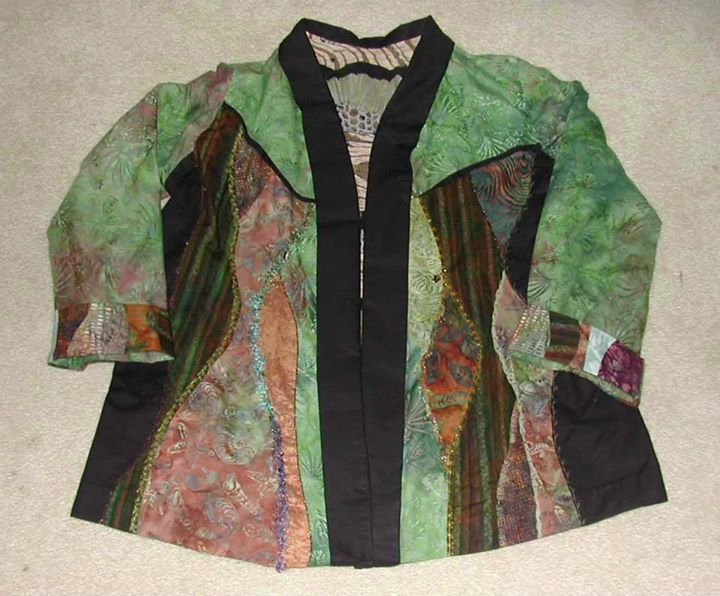 I used hand-dyed gradation and printed fabrics and continued to use the curved piecing technique I learned through reading Vikki Pignatelli�s book. 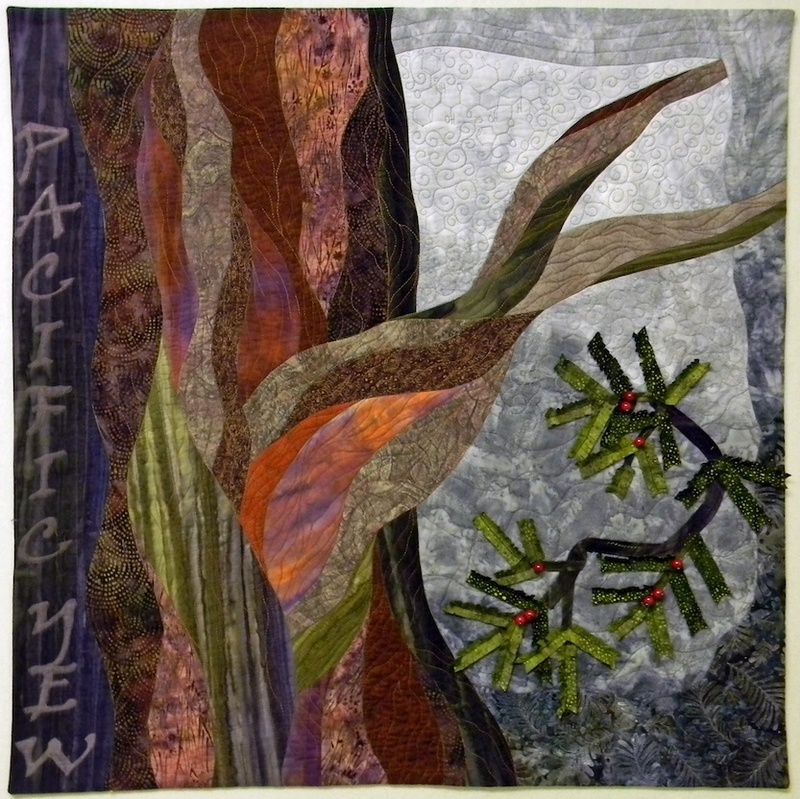 Travelling the National Parks have given us inspiration to put some of our memories to quilt! 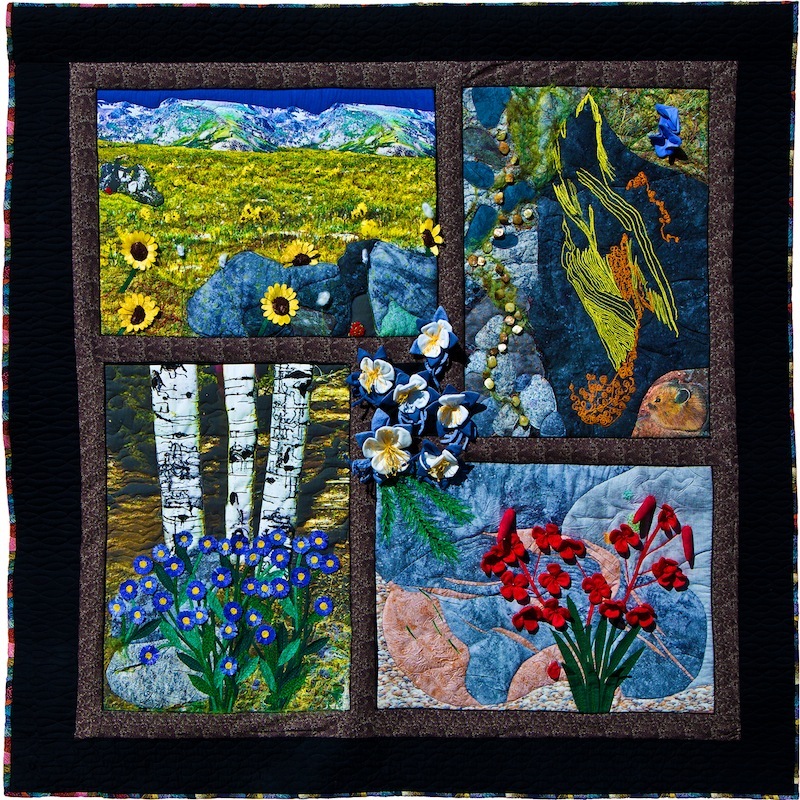 Nature's Gardens portrays 4 specific places within Rocky Mountain National Park: upper left block is Rock Cut & the Toll Memorial, upper right is Lilly Lake; lower right is Lawn Lake Alluvial Fan; and lower left is Deer Mountain. Each block has your technique which is my favorite. The combination of your technique with the photo collage gives an effect of a diorama. 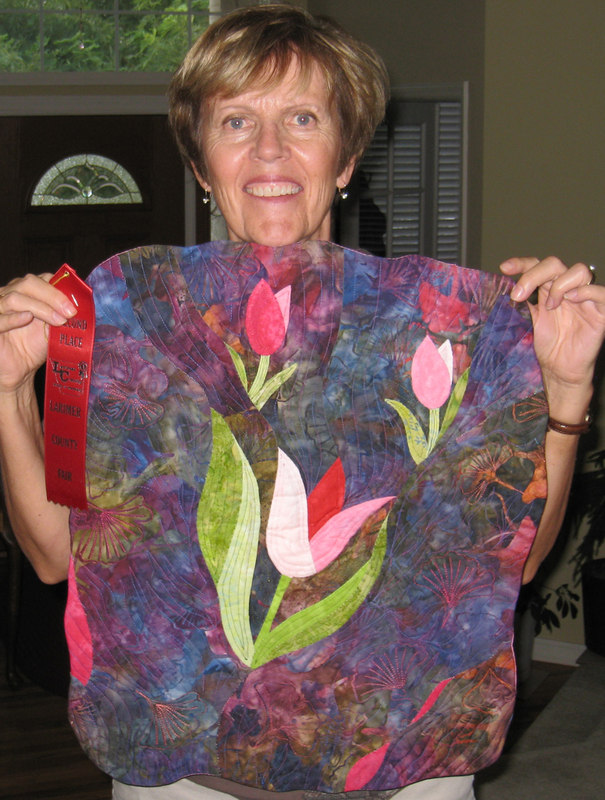 Thank you for being a quilt teacher and an inspiration; I will always consider you as my most important mentor. Note from Vikki: The rocks and background foundation blocks in this 60" x 60" are made with my curves technique. 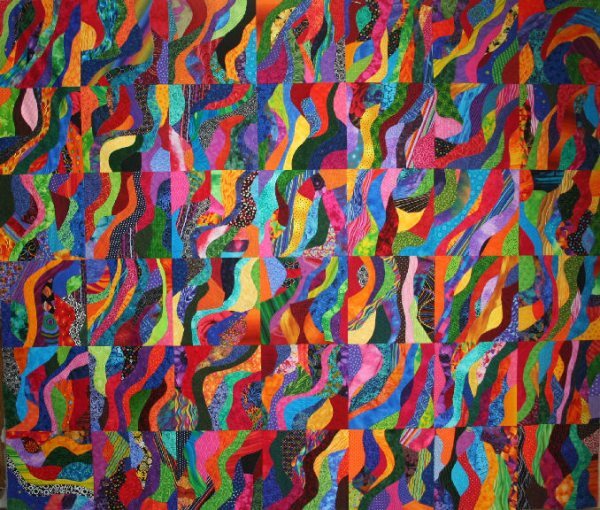 This quilt also includes a large variety of other artistic techniques from other teachers. 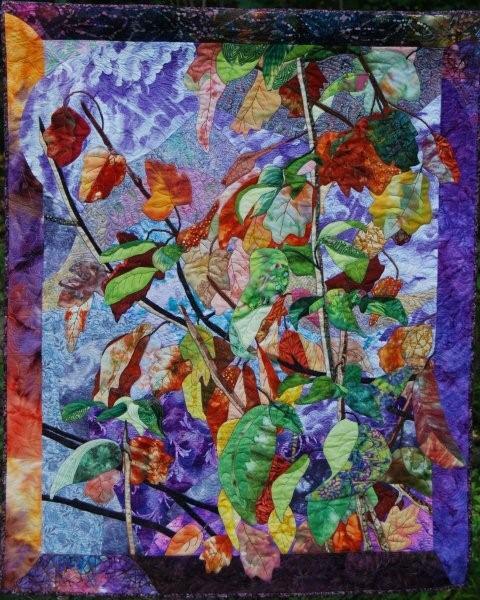 Shari has done an amazing job of combining them in this beautiful quilt! In the winter of 2011 there were two snow storms back to back dropping 22" of snow in the Chester County area. While it took weeks to melt, I wondered about the joys of spring beneath the snow. 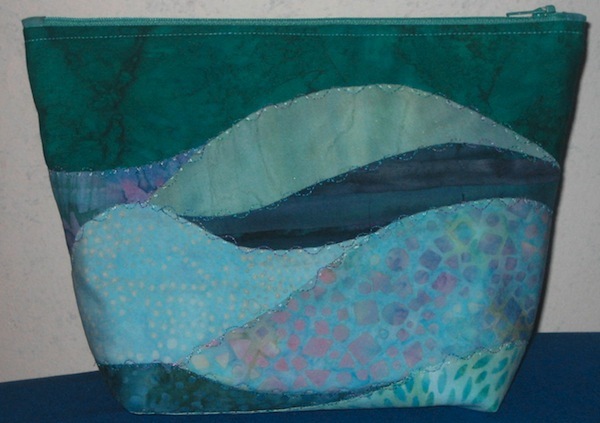 In this fabric art I used the technique of curved piecing taught by Vikki Pignatelli, applique, and handpainted fabric. 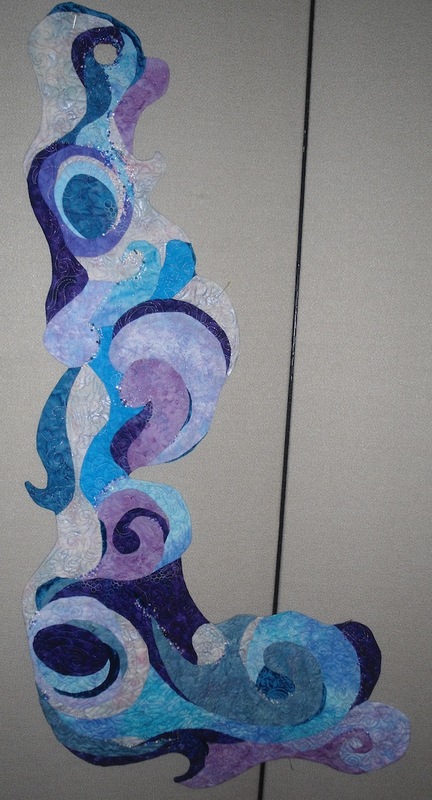 72" x 18"
Icy Water was started during Vikki Pignatelli's Improvisation workshop in Arva Ontario in 2012. After finishing the sample I decided it needed more action and added a female cardinal gliding over the frozen water. These birds are a favourite in my garden in all seasons. I created the Spring Dancers pattern for a reverse applique stained glass quilt and then adapted it to use Vikki's topstitch piecing method. Making the design twice with two different techniques was a great comparison. 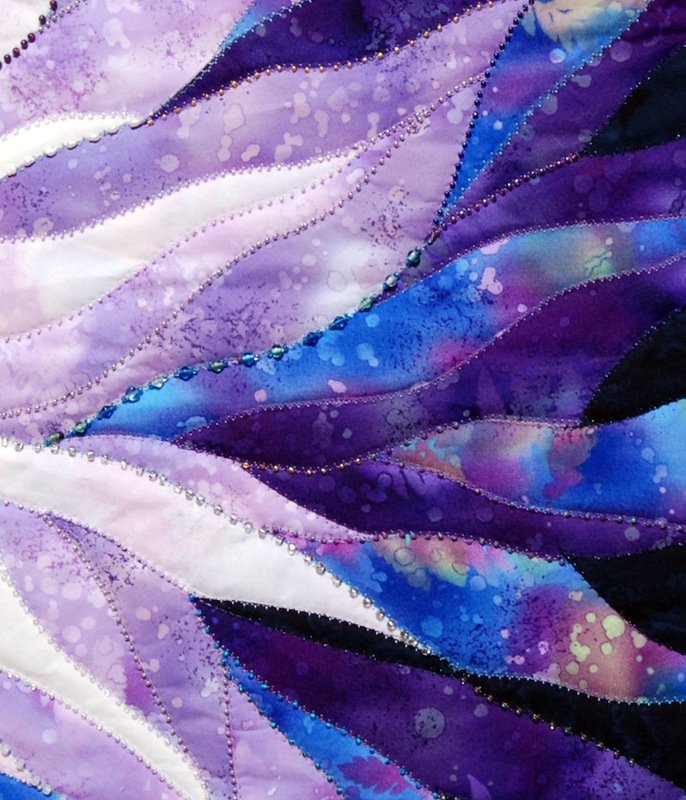 The topstitch technique provided a lot more scope for improvisation, free motion quilting and embellishment. It was a good way to cement the technique for me, including some lessons learned for future projects! Using the curved piecing technique I tried to capture the movement of water. 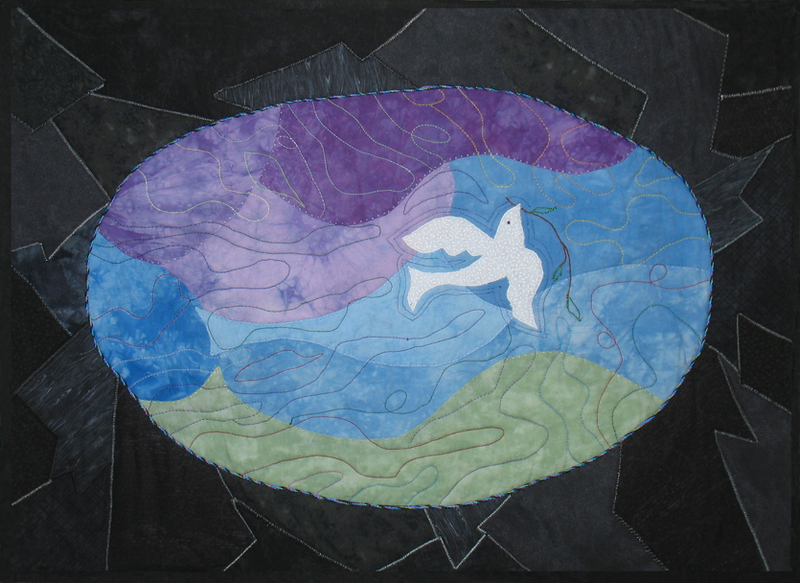 As I pieced the motion and flow of the water I thought of the children of Israel passing through the parted sea. God's Word says..... , "there wall of water on either side of them." 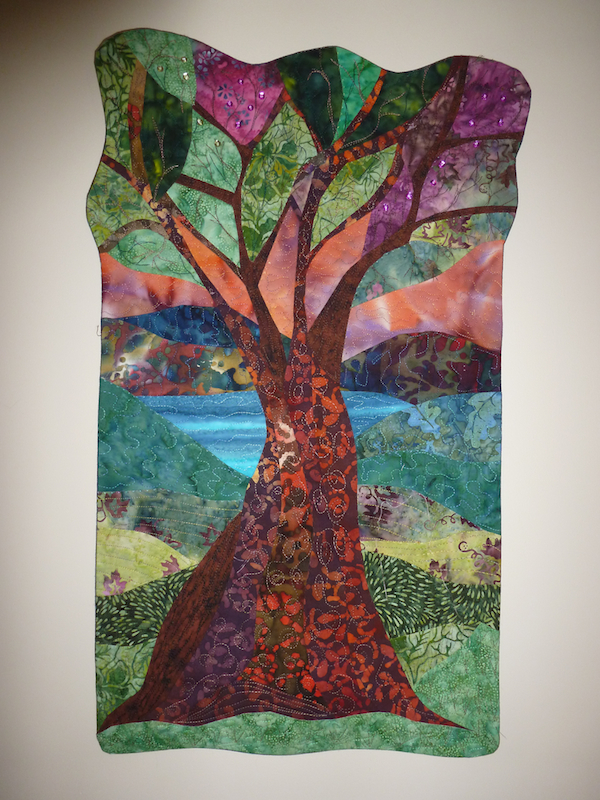 40" x 22"
I created Going Home for a friend who passed away after enduring a long ordeal. Finally his soul was free to soar. It was no longer bound by an ailing body. Going Home is 14" X 18". 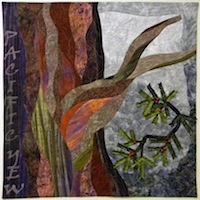 Native Americans have long used Pacific Yew for its healing powers. The Pacific Yew (T. brevifolia), yields the complex compound found in Taxol. Used in treating breast and ovarian cancer, this chemical is found in the bark, leaves and heartwood of this slow growing trees but it requires nearly 63 pounds of bark to treat one patient. Rigorous research has not only isolated the compound, but also developed a way to synthesize the chemical saving both trees and patients alike. 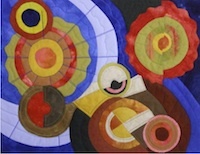 This quilt is a part of an installation of cancer themed quilts at the National Institutes of Health in Bethesda, MD. 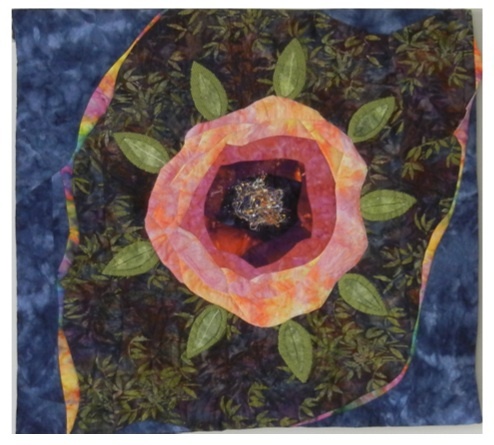 To learn more visit: Healing Quilts in Medicine. My two adult daughters came away for a week's vacation with my husband & myself in May 2012. One day, we visited the Botanical Gardens which is a vision of what one might think of as 'paradise' with all the flowering plants & vines in profusion. This lotus was a first for me - having read about them and seen them in photographs, I was much taken by the fact that I was seeing a real one. We took photographs of many plants and flowers but the lotus was the one that stuck in my mind and heart. rainforests full of giant trees, vines and epiphytes. The strangler fig is an iconic tree in our forests. Birds eat the fruit and deposit the seeds on branches of other trees, where they germinate and sends roots down the tree to the ground. Gradually over many years, the fig overwhelms the tree with a lattice of roots which eventually fills in and the tree inside dies. It can take over 100 years. Meanwhile, the tree is a haven for all sort of creatures, animals, birds, plants and insects, who live between its canopy and the rich forest floor. 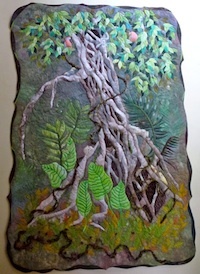 I have tried to depict this in my quilt, with trepunto work in the fig roots and creatures to provide a 3D effect. 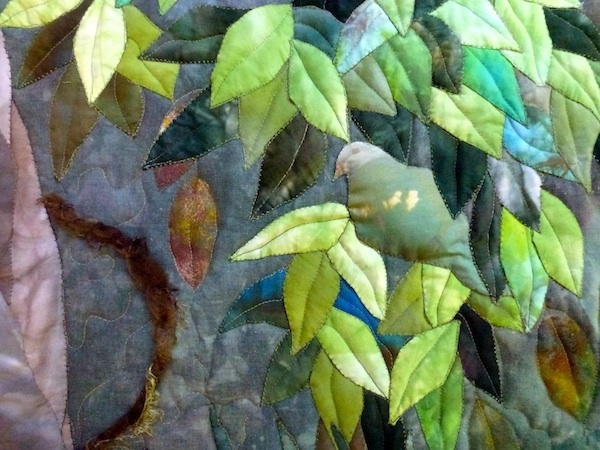 The birds and animals were printed from photographs onto cotton on a computer printer and appliqued on. 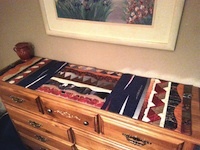 All the other fabrics used were my own hand-dyed cottons and silks. 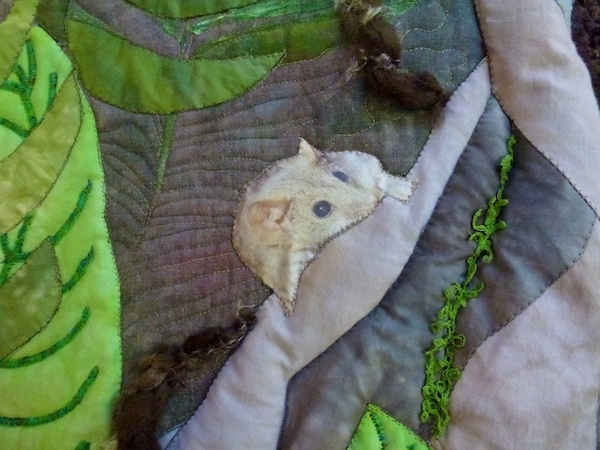 Some details, such as the vines, were hand-embroidered on after the quilt was completed. 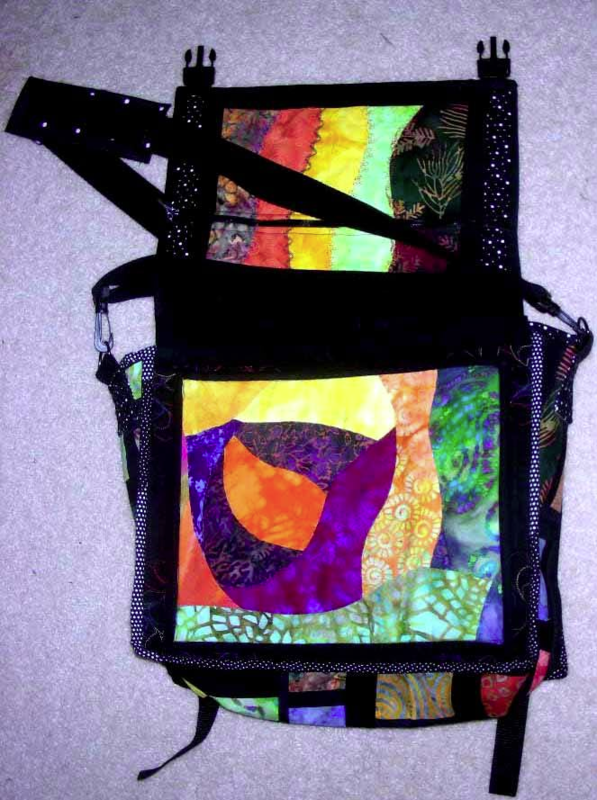 This piece was the product of my first class with Vikki Pignatelli which was held at the Jabez Quilt Seminar 2012. I really enjoyed what was a new technique for me; I can see so many possibilities. This class was exactly what I needed to jump start my creativity. Vikki is an incredibly good teacher: informative, helpful and encouraging. 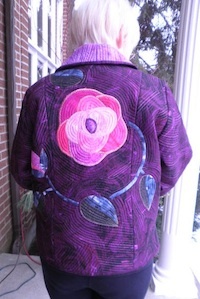 Inspired by your recent workshop, I used the Cabbage Rose design together with techniques that you were teaching to adorn a spring jacket for my wife. For each of the eight construction pieces, the designed top fabric is sandwiched and echo quilted before being cut to size. The seams and the edge are hand bound. After completing Vikki's large star, I thought it needed a small companion. Vikki suggested two, so I redrew the smaller star and the real adventure began. Placing the 2 small stars was the easiest part. The borders were the real challenge, and a great learning experience. 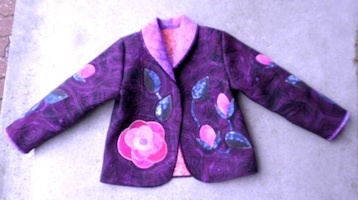 stacked buttons; the tail is felted sheer; and the quilting was a leaf pattern that I thought looked like seaweed. Shari Thompson in Tucson, AZ. Nestled in West Thumb Geyser Basin, the Seismograph Pool bubbles away at a temperature of164�F. Thermophiles, extreme heat loving organisms, live in this pool. Thethermophilic communities are made up of bacteria and archaea which can take a variety offorms from brightly colored mats to streamers in the runoff water. Using techniques taught by Vikki Pignatelli, I have interpreted this evidence of life in a Seismograph Pool. 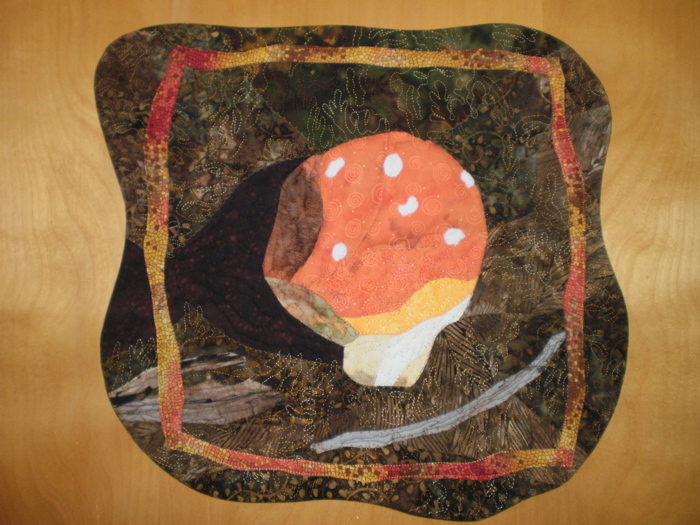 The quilt is 47 inches wide and 37 inches wide featuring authentic bison hair (purchased) needle-felted into parts of the quilt. Angelina fibers, foils, and TextureMagic were utilized to interpret the hot spring with its microbial mats. Small blackbuttons symbolize the tiny ephydrid flies that live there year round. 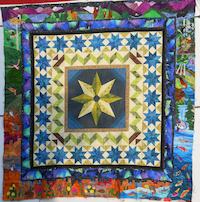 After seeing Vikki's beautiful quilts the 1st day of the workshop I was inspired to use my imagination and creativeness to create my own design. The design came from seeing a friends beautiful photo of a water lily. I used the picture and Vikki's fabulous techniques as an inspiration to create my design. 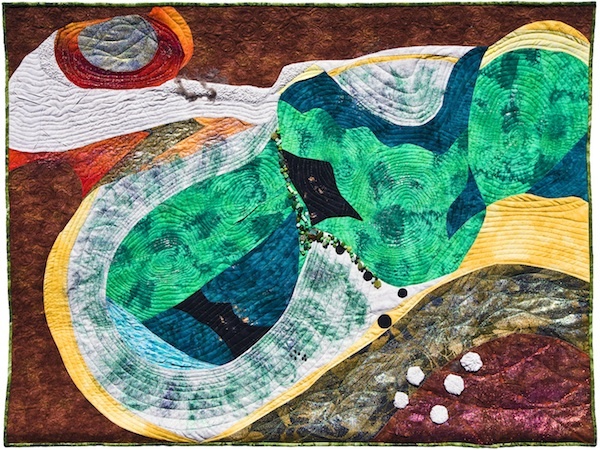 The outer green border of the quilt is a reverse whole cloth facing. Thanks to Vikki and everything I learned during the 2 day Crazy about Curves workshop; I already have visions of a new quilt dancing in my head. In Interior Alaska where I live, these beautiful and poisonous Amanita mushrooms pop up at the edge of wooded areas adding their bright orange-red color to a waning summer landscape. Though I appreciate large vistas and landscapes, I often find myself examining the individual tiny wild flower, a small colorful caterpillar or the way a piece of bark curls. 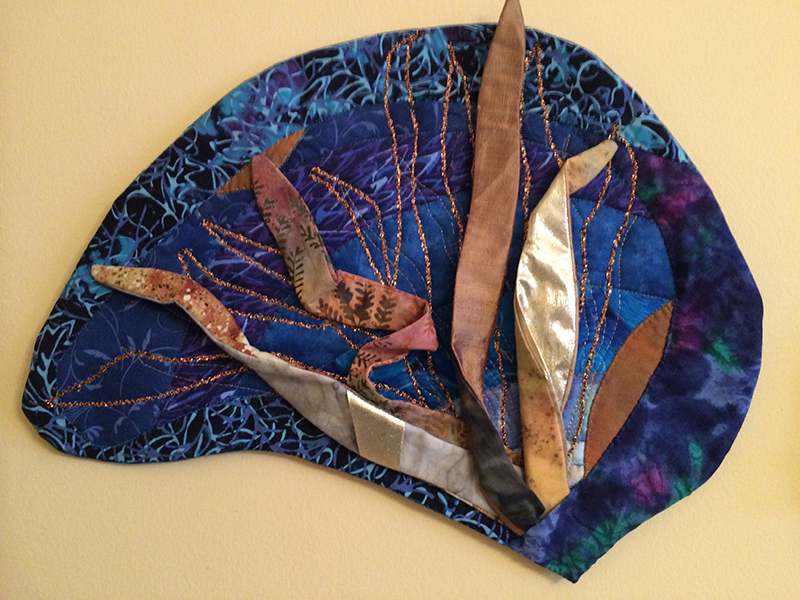 I created this little wall hanging from a picture I took of a large fist-sized beauty in my yard. I used a bit of extra batting in the top part of the mushroom to help give it its roundness, This is my first original using Vikki's technique but it definitely will not be my last. 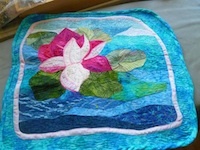 This wall hanging was begun in a 2-day workshop taught by Vikki Pignatelli in Leamington ON Canada in July 2010. In those two days, Vikki taught us a new way of sewing curves and by exposing us to her improvisational techniques, she also encouraged us to loosen up and step out of our "quilting boxes". What a gift. Thank you so much, Vikki. Hearts are a symbol I have always felt connected to. They express joy, sadness, longing, whimsy, and of course, love. I have gone through a tough few years in my personal life brought on by my daughters battle with drug addiction. The loss and pain threatened to shut down my creativity and caused me to withdraw into myself. 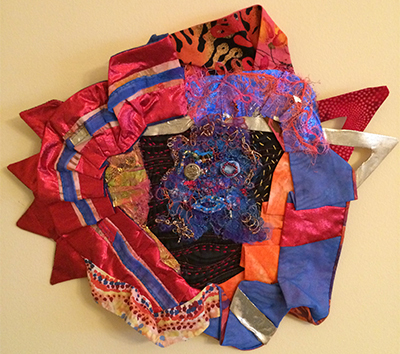 Attending Vikki's workshops with a dear friend was a big step to regaining my creative fire. Reawakening my passion. The trapunto heart represents the fullness of emotions that I have "stuffed" inside. The icy blue color is a metaphor for hibernation. It is set on a dark background that represents isolation. I worked the flames in pieced and appliquéd fabric, thread, and fabric glitter because my creativity is being reawakened through all the forms of quilting that I enjoy. 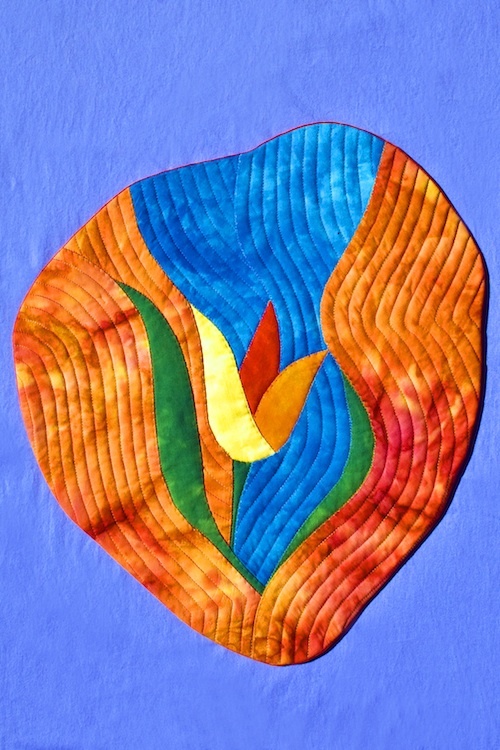 Since my business is quilting for others, making expressive art quilts is something I am doing to feed my own creative soul and free the emotions that have been trapped inside too long. I don't have to worry if it is good or bad, I just create. 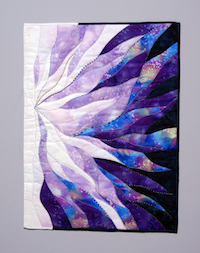 I enjoyed using Vikki's curved piecing techniques to draft and piece my original design. I used the faced backing technique because I wanted a finished shape that shows the flow of emotion that I feel with this piece. 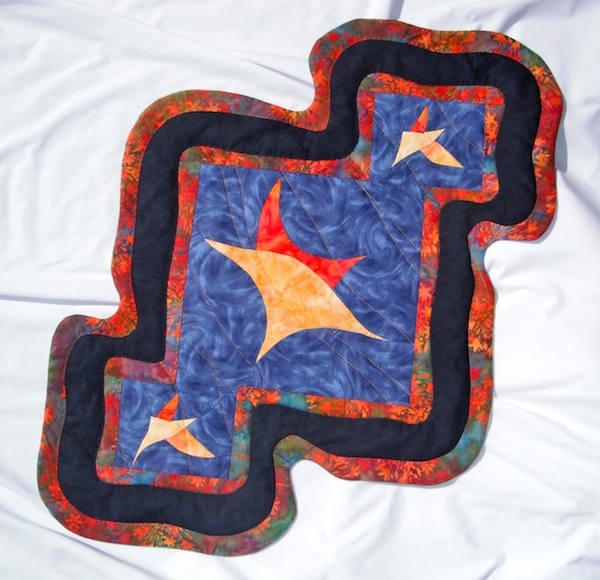 I love that my quilt doesn't have to be a "square peg". Thank you, Vikki, for helping me reawaken my passion! 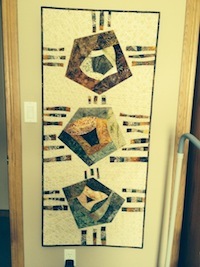 I made this quilt this summer for a local Guild Challenge. We were each given a box top and had to make a quilted item based on the top - we just had a few basic rules. Anyway my box top was from a box of Christie 'Toppables Crackers'. I have both Vikki's books which I love to look at and have always meant to make a quilt using the curved piecing techniques. So I took this opportunity to challenge myself do so and just wanted to say how very easy it was to follow the instructions. They are set out so clearly and I was delighted with the results.... mine actually won Favourite Quilt. Thank you very much for teaching me this wonderful technique through your books. 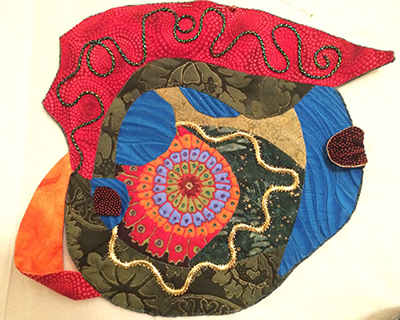 At a course with Vikki Pignatelli in February, I took a leap forward to the next level - following my intuition. The inspiration for this piece was a photograph of a piece of rotten tree trunk. It was a rather thin trunk with weathered silver wood and a lot of interesting shapes. 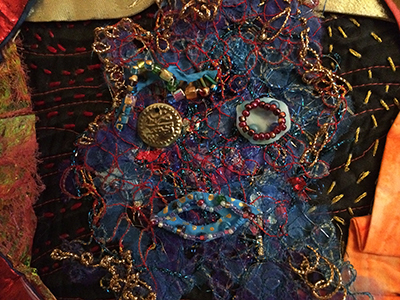 The exercise was to create depth with light and dark fabric. Vikki has no rules when she teaches and loves to see students create outside of their comfort zone. I didn’t quite know how to start this quilt. 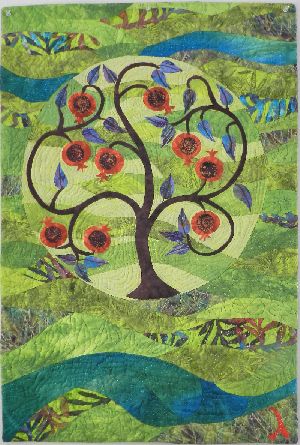 When I finally got a few pieces cut and placed on the green background, I took off. I forgot to look at the photograph and let my intuition lead me. 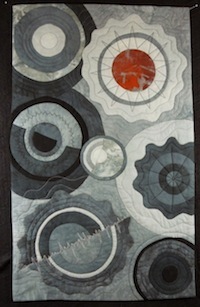 For me, this is the spice of life: to forget convention and rules in quilting - to follow one’s intuition in creating. 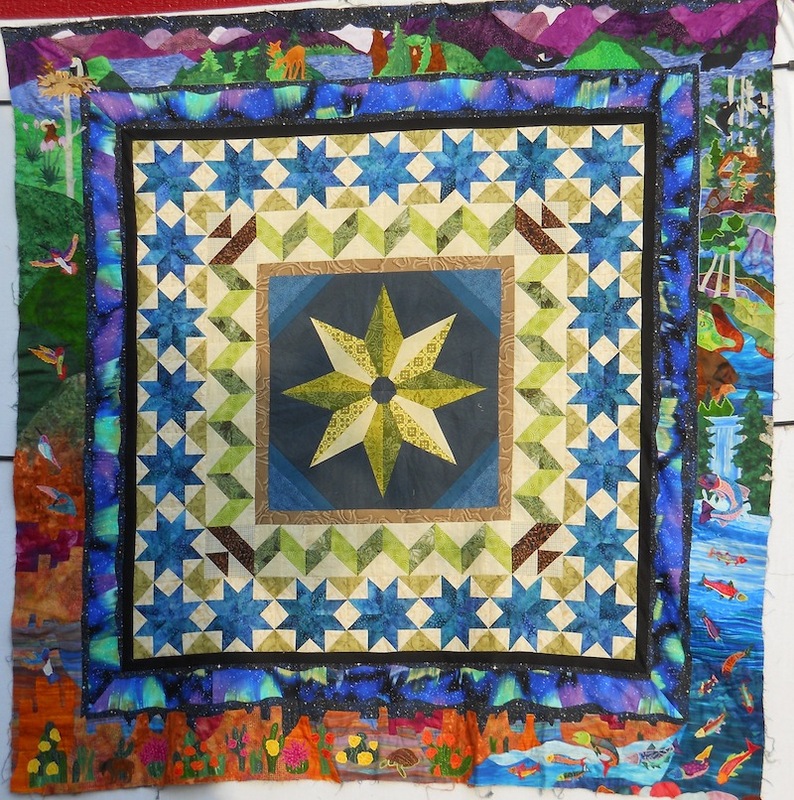 In April 2010 I participated in Vikki�s patchwork workshop in Denmark, Vigersted. 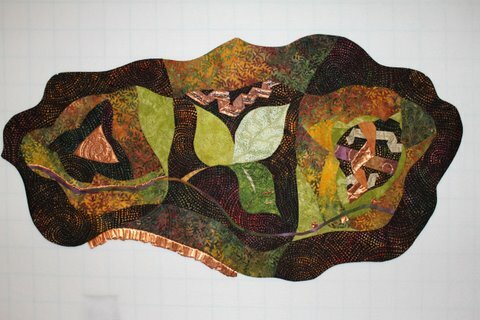 It's All About Curves is the small workshop piece I made while taking two workshops from Vikki Pignatelli, quilt artist, in November 2009. 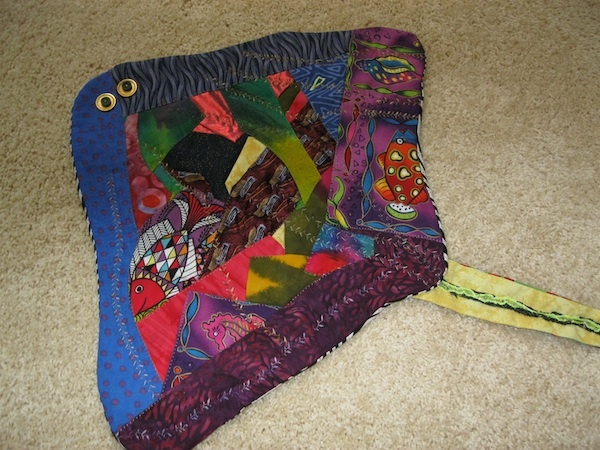 It is bound using the whole cloth facing technique. Made at a class in Denver. 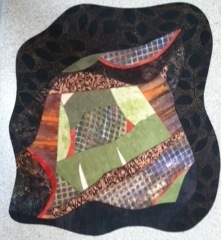 This quilt evolved during a week-long class at Asilomar. The center panel used Vikki's pattern to get the hang of the technique; the outside panels were all created spontaneously as I sewed. 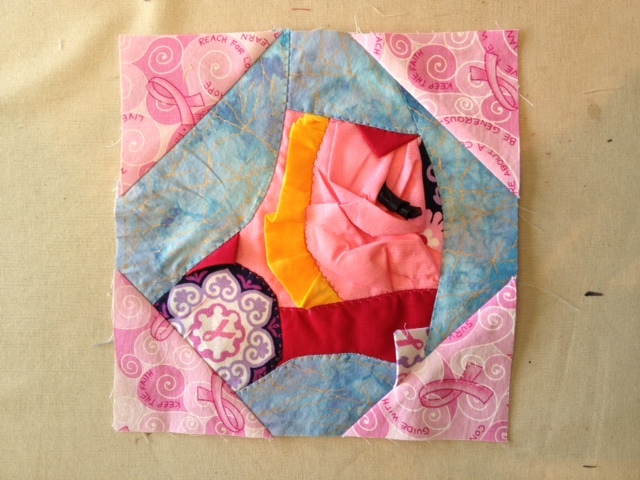 Great class, much fun, and I love Vikki's curved piecing method. 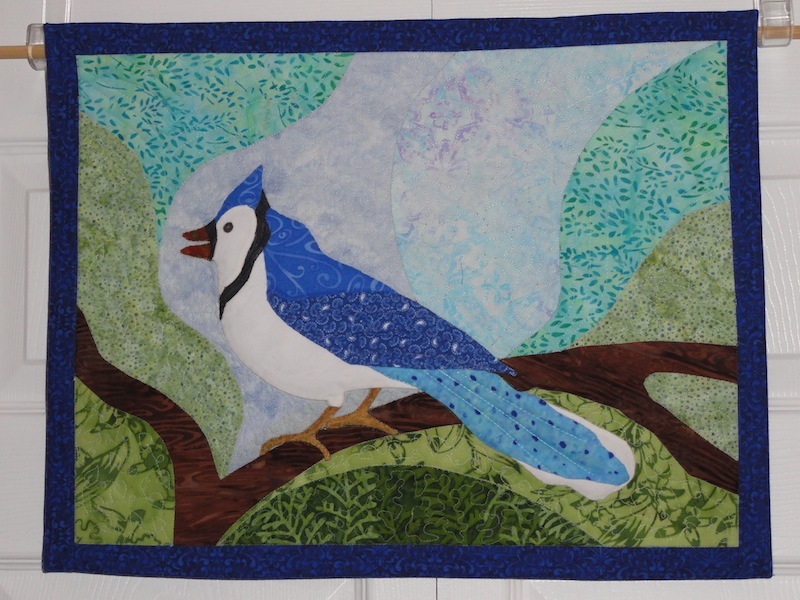 It did win a first place in art quilt category at our local fair last summer. "Red Adair" was created in Vikki's class at Asilomar (Monterey, CA). June 2010. Crunching of fabric, ironing it flat and then sewing curves was a great experience. Adding "shiny stuff" was an awesome experience the entire class will never forget. No longer am I intimidated by curves. In fact I love improvisational curves. 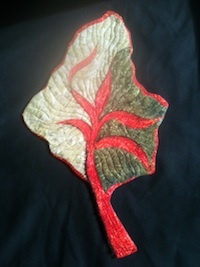 This little wall hanging is small, yet fiery. Made at a course in Vejerslev in Denmark. 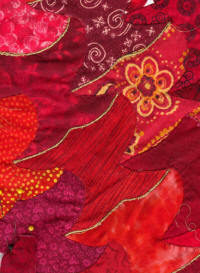 This is my first trial with Vikki's special way of sewing curves. I just draw some lines with the flexible tool for designing curves. Choose fabric. What came out, it looked like an angry owl or a face of some kind. It made with a colour (pink) I normally never use. 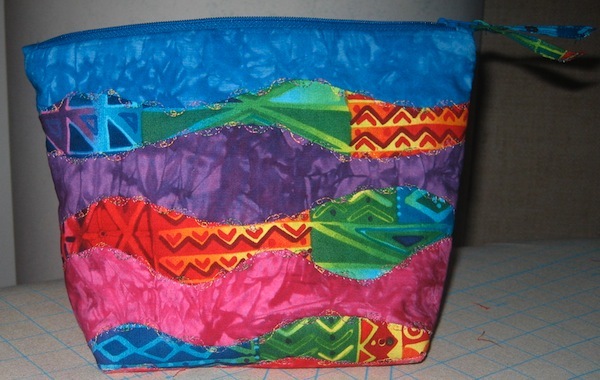 This was fun making and it will not be the last time I try using Vikki's special way of sewing. 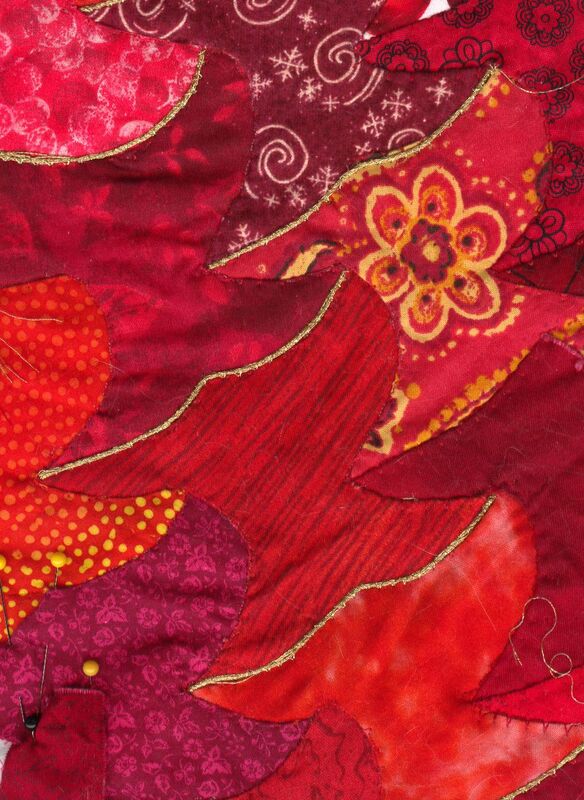 The red quilt I started on in Vejerslev (in class). It is improvisation and I made it so I could try some different techniques. The owl was my own idea and I have been drawing it with the flexi curve tool and sewing it after Vikki's techniques. 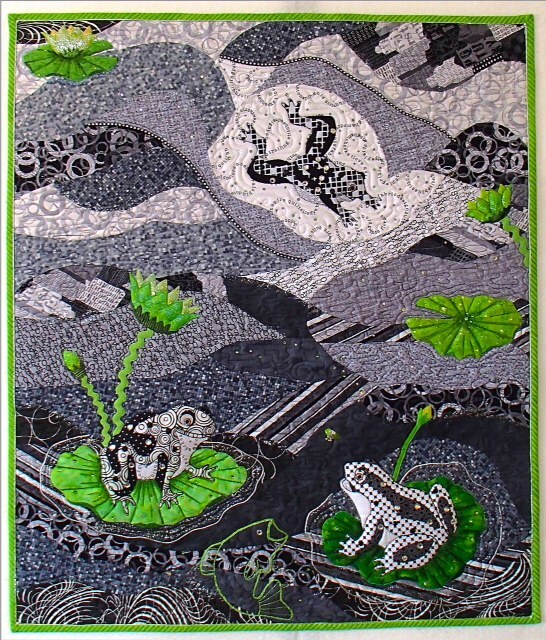 It was fun to make my own idea in a quilt. And it was easy to work with the technique. 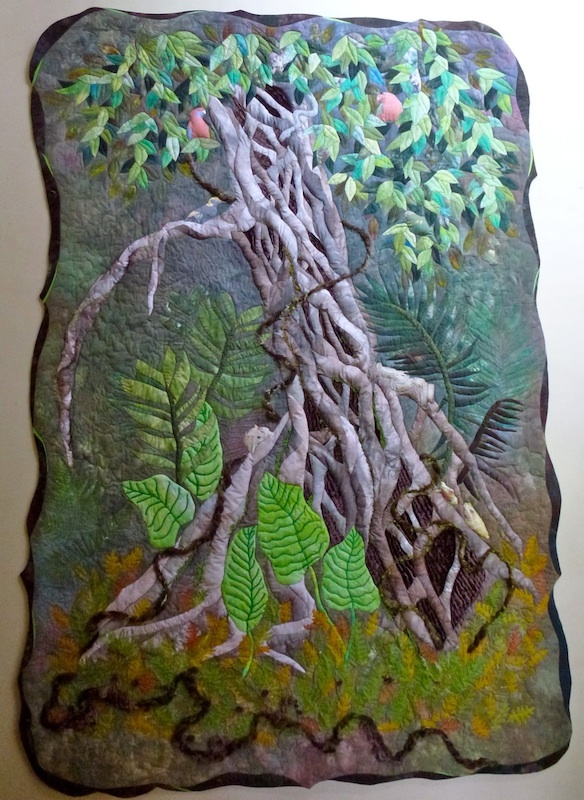 I started with a background made with the topstitch piecing technique. 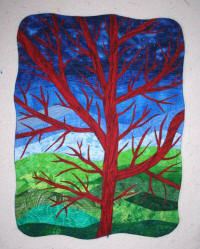 I then added the trunk and major limps of the tree using tubes and added smaller branches using steam a seam 2. 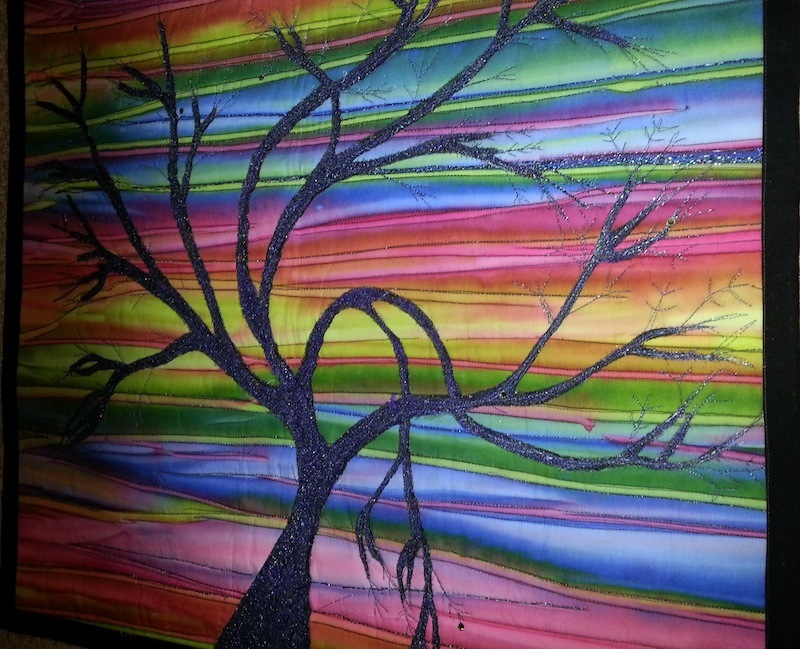 I enjoy drawing trees and I am finding I like designing trees with fabric. 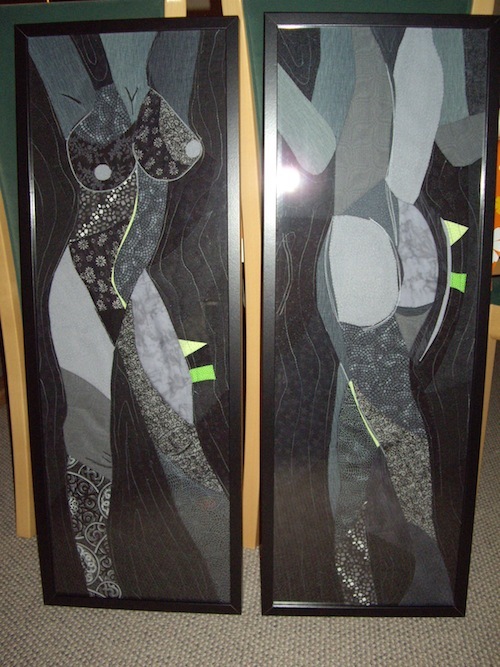 The three images on the black canvas were created individually using Vikki Pignatelli's techniques. I decided I wanted them presented as a whole so secured them to a canvas with a Gee's Bend not solid black fabric top. For the individual images I used Vikki's topstitch appliqu� technique and heavy blanket stitch and finished each one with her envelope backing. The binding for the larger canvas was finished using a satin stitch. 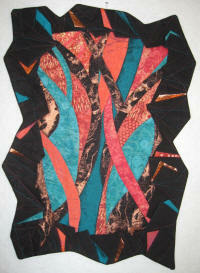 I am new to quilting, particularly art quilting, having been into it for just over a year now. I had the creative ideas but not the skill of the craft, i.e....the sewing machine. I happened upon Vikki's book and DVD and off I went. 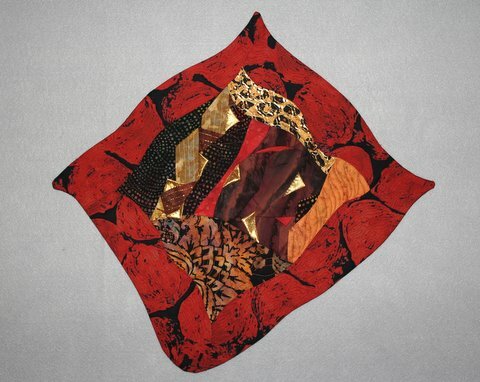 I can relate to her quilting history as I too had no desire to make traditional quilts. I was in a carriage driving accident a couple of years ago and couldn't drive cars so was at the mercy of friends. One friend, Pat Nelson, also a well-known quilter, both traditional and art, took me to a local art quilt club meeting (Mountain Art Quilters.) At this point, I would go anywhere, just to get out of the house. 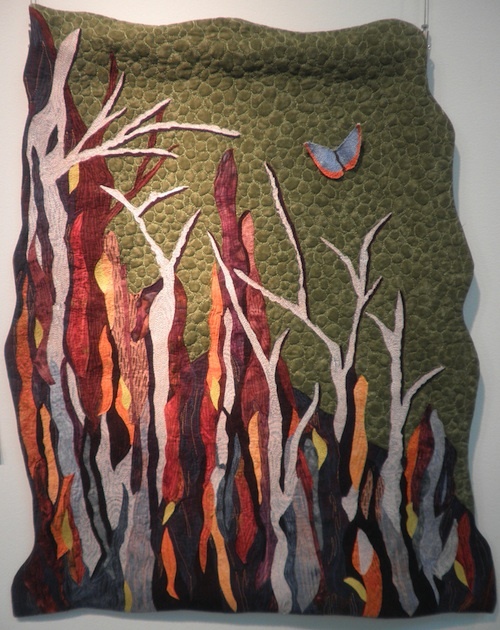 Quilting didn't sound very interesting but I quickly changed my mind as what I saw was fiber art, fantastic creative art quilts. I was hooked and Pat took me down to the Bernina dealer after the meeting where she helped me select the best Bernina for my needs. I bought a Bernina Activa 240. The rest is history. The veins on the leaves are metallic thread. The background is quilted with traditional motifs using silk thread. 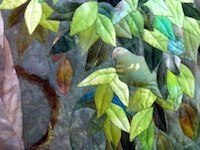 The background was appliqu�d using your top stitch piecing method. The leaves were fused because I had started the process before reading your book. 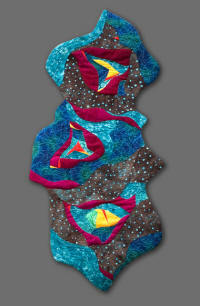 My triad color choice for the background was chosen after reading your chapter on color in "Quilting by Improvisation". My original background just wasn't working. 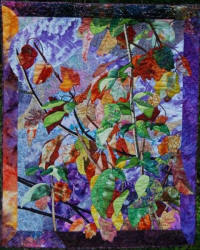 Then I tried the shades of violet and the leaves popped. 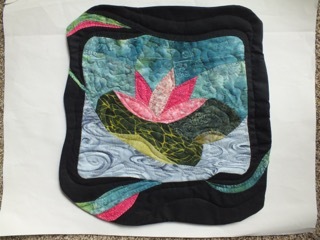 I made this quilt after seeing the one you had made in one of your books. My son is a captain on private yachts and has this on his wall in the captain's quarters. He is really pleased with the wave motion. I love making quilts with your technique. 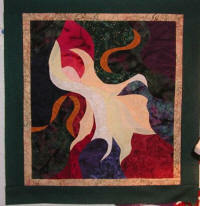 This is the spirit I made for my sister and hangs in her home in NC over the fireplace. She loves to see it every morning when she and hubby wake up. She says it starts her day with a smile. 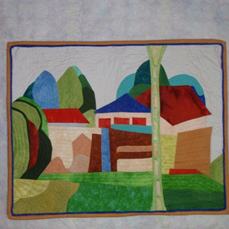 I made this small quilt as the challenge for Pigeon Forge in 2009. 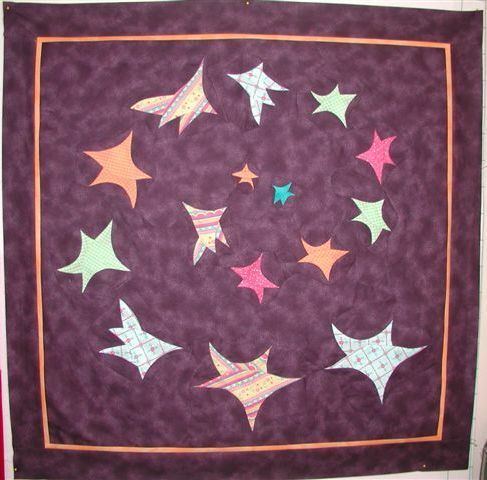 Stars are a big part of my quilting life and these are special to me as this is the first pattern I learned with the curved machine appliqu� method. 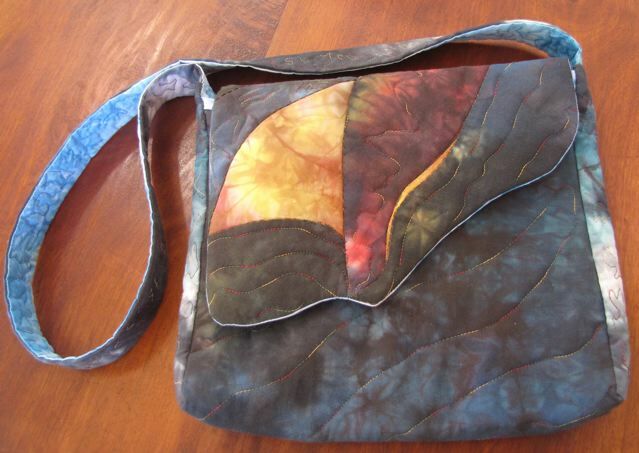 "These are photos of a handbag I've just made for my mother's birthday using improvisational curves. I'm quite pleased with how it turned out. I've fitted the inside out with little pockets for her glasses, phone, hearing aid batteries, pen etc so she can find everything in it easily without rummaging. I hope she likes it." 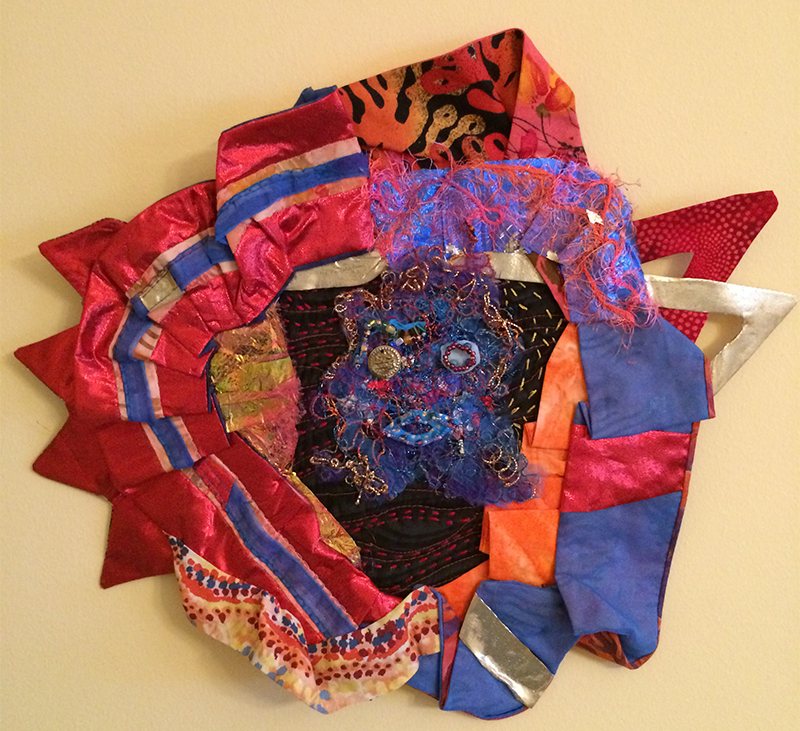 "Last year I attempted to make an "art quilt" , not really even sure what that term meant. I felt led by God to do one on the "I AM" sayings of Jesus. God put the picture in my mind, but I didn't know how to make it reality. I had never done anything with curves, only straight lines and block patterns. I bought Vikki Pignatelli�s book and poured over the instructions. 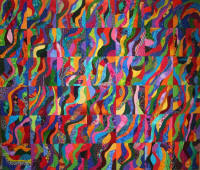 It was so much fun to see what I had seen in my mind actually coming out in the form of a quilt. I thank Vikki for her encouragement and help. 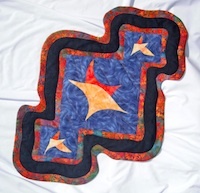 I am on a new journey in quilt making now and it�s so much fun!" 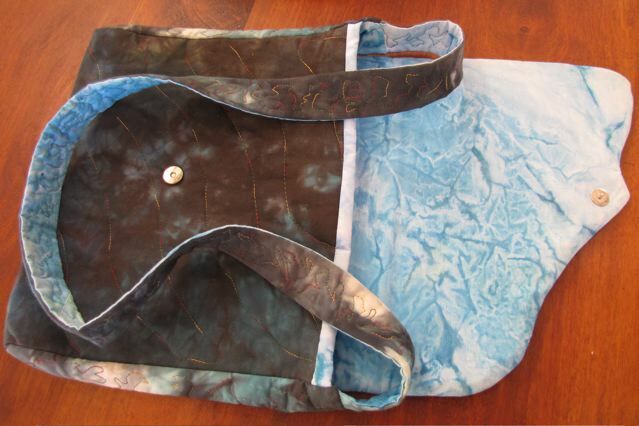 "I'm sending you a picture of what my Scrap the Pattern workshop piece turned out to be... I really enjoyed it, and it has given me a glimmer of hope that I might have some dormant creativity wanting to spring to life." I made Fire Dance under the direction of Vikki Pignatelli. 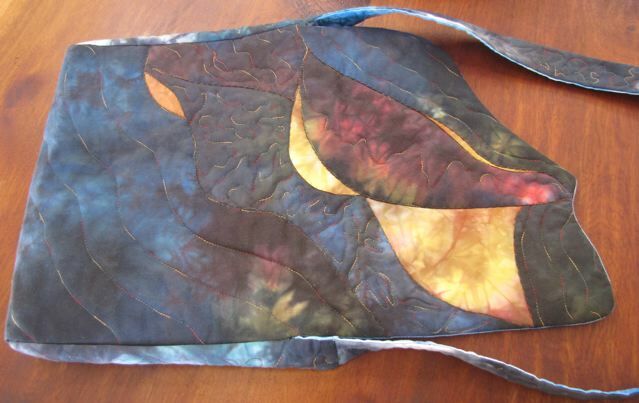 I visited her home for 3 wonderful days in July 2008 and made this journal piece to experiment with her techniques for improvisational design and curved piecing. 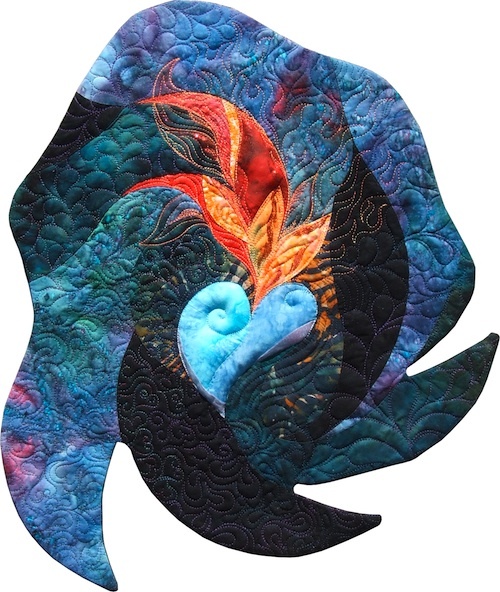 Fire Dance shows the spirit of God in waves of energy, moving over the earth during creation. In the earth�s initial stages, God�s spirit, represented by fire (coral), the waters and air (teal), and the earth (black) are all inter-mingled while the spirit creates their form and they become distinct entities. 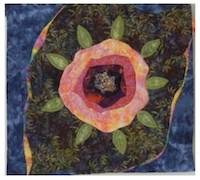 One of the quilt groups I attend is called Playing Outside of the Block. 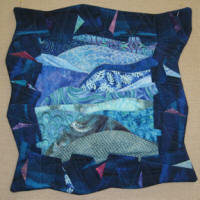 Its a wonderful mix of traditional and art quilters. 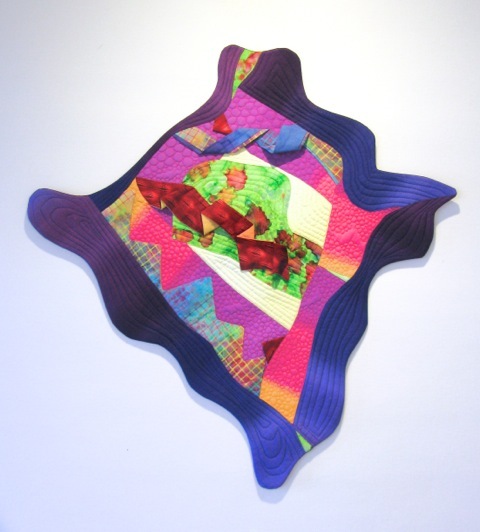 A challenge was issued to make an 18" x 18" piece on the theme of cool or hot. I chose to make a cool piece. I wanted to practice the skills I learned from Vikki on pleated borders and curved piecing. So this was a perfect opportunity to make a small piece.